For our comprehensive studio project, we were tasked with designing a Dance School in downtown New Orleans. With 15 years of Classical Ballet training under my belt, this project was such an exciting and rewarding opportunity. This proposal included six dance studios, a small blackbox theater for 50 people, a large auditorium for 300 people, a central courtyard, a bookstore and cafe, as well as a triple height gathering area that connect the more private spaces for the dancers with the circulation for the patrons and visitors. In the studio, we were tasked with resolving structural systems and MEP systems, as well as adhering to all building codes. I selected a wooden framing system for my proposal. These two images illustrate the massing and exterior design strategies. A long, triple height space flanks the sidewalk to welcome visitors and patrons, and connects the 200-seat auditorium with the dance studios, courtyard, and blackbox theater. The first floor is kept open for a cafe and bookstore. This view shows the triple height entry lobby, which welcomes both patrons and dancers. The space is filled with light and opens up to a bookstore and cafe, both of which are accessible directly off the street front. The top image shows a typical dance studio, which has floor to ceiling windows and exposed wooden beams. 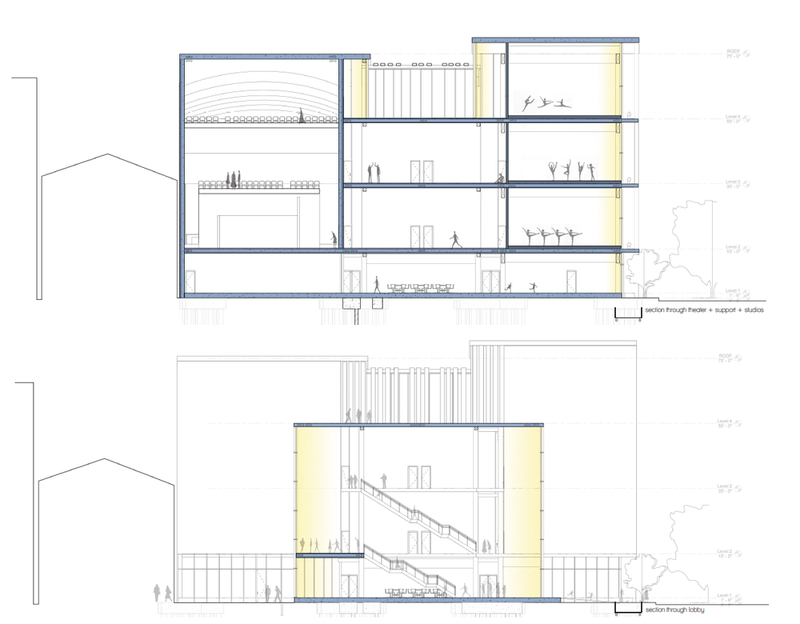 The bottom image below the private circulation for the dancers, as well as the classroom and blackbox theater/studio space.